Kepco will modify the standard models you see here on our website to give you custom solutions in cases where the standard voltage or current don't quite match your requirements, or where you need special features that are not standard. Modifications to our standard models can now be requested via our new on-line Modification Request. 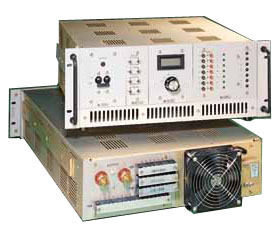 Kepco also integrates standard and customized power supplies and power assemblies into turn key rack cabinet solutions. Kepco integrates our Pluggable/Hot Swap power supplies into pre-configured, turn key, multi-output assemblies and rack cabinets. Series RA 19-1U Rack Adapter. Power Assembly drawers and cabinet assemblies may be integrated with DC distribution panels. See examples.